Two of the federal government’s top management officials on Wednesday defended proposals to freeze civilian workers’ pay in 2019 and to implement myriad cuts to retirement benefit programs. 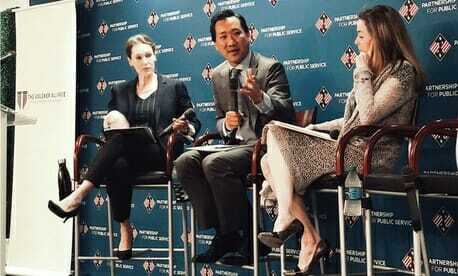 At a civil service reform town hall hosted by the nonprofit Partnership for Public Service, Office of Personnel Management Director Jeff Pon defended the Trump administration’s plan to freeze the pay of all civilian federal employees in 2019 as needed to “collect data” on compensation and as a chance to “right-size” the pay for different government occupations. Pon and Office of Management and Budget Deputy Director for Management Margaret Weichert discussed their visions for civil service reform, including overhauling the government’s compensation structure and providing greater retirement flexibility for feds to improve the hiring process and recruit the next generation of public servants. Weichert touted the White House’s proposed $1 billion interagency workforce fund, which would fund pilot programs for innovative personnel systems. But shortly afterward, Pon defended a series of cuts to federal employee retirement programs, which he advocated in a recent letter to House Speaker Paul Ryan, as not part of the compensation discussion. Among the proposals are the elimination of the Federal Employees Retirement System supplement for employees who retire before age 62, changing the basis of retirees’ defined benefit annuity payments from their highest three years of salary to their highest five years and a multi-year increase of the amount employees contribute to FERS. The plan also would eliminate cost-of-living adjustments for FERS participants and reduce COLAs for Civil Service Retirement System retirees by 0.5 percent. While some proposals would only impact workers going forward, the changes to COLAs, as proposed, would impact “current and future retirees,” Pon said in his letter last week. Pon said the government must adjust how it provides retirement to adapt to a workforce that is far more likely to switch jobs frequently, rather than stay in one organization for decades. And federal workers in good standing should be able to be brought back to the workforce outside of the competitive hiring process, if they temporarily leave an agency to work in the private sector. Weichert said that part of any effort to recruit the next generation of federal workers has to be how the jobs are pitched, which she said dovetails with her desire to counter the “Drain the Swamp” rhetoric popularized by President Trump. To learn more about your retirement benefits, please visit our contact us page to request your personalized retirement review. I hope we continue to fight hard for our brothers and sisters for our retirement benefits.